The finance minister said the hike in the country's minimum wage is having a partially negative effect on the economy, but it is the right course for the economy to follow. 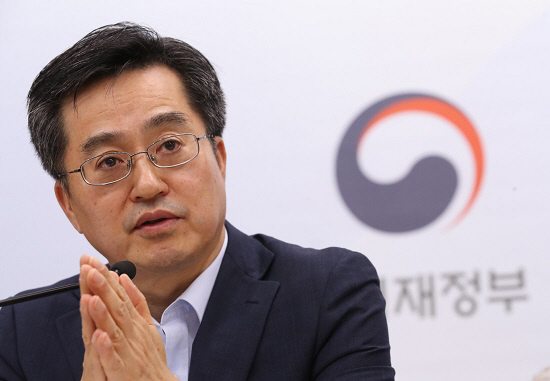 "It is necessary and important for the wage hike to take root in our economy, and it also needs some adjustments to send a stable message to the market," he said. The government is preaching a policy of "income-driven growth" that calls for a virtuous cycle of increasing household income and spending. But the country's job market conditions remained in the doldrums, with opponents arguing that the policy should be scrapped. Asked about the tumbling stock market, Kim said the situation hasn't reached a point of panic. "We're keeping close tabs on the stock market with a 24-hour monitoring system," Kim said in response to a comment that there is a concern for market panic. "We have our contingency plans on the market. And it's not appropriate for the government to rush to a conclusion on the stock market."